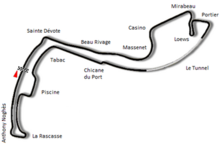 The 1985 Monaco Grand Prix was a Formula One motor race held at Monaco on 19 May 1985. It was the fourth round of the 1985 FIA Formula One World Championship. The race was won by Alain Prost driving a McLaren. As usual for the time the FIA allowed only 20 cars on the grid due to the tight confines of the Monaco circuit meaning a total of 6 cars would fail to qualify. There was a big accident on the pit straight involving Nelson Piquet and Riccardo Patrese, this accident was to affect the outcome of the race. The accident happened right after Piquet and Patrese crossed the start/finish line, Piquet attempted to pass Patrese, the two cars touched and Patrese crashed violently and collected Piquet, whose Brabham's rear suspension broke during the collision before Patrese collected Piquet. The cars then spun into the run-off at the first corner at Sainte Devote; both drivers were unhurt. Patrese's gearbox dropped oil onto the track which took out Niki Lauda who while sliding off on the oil managed to avoid hitting anything, he stalled his engine and was out on the spot. The crash also nearly took out the closely following Jacques Laffite and Teo Fabi, while race leader Michele Alboreto also slid wide on the oil; Alboreto's off handed the lead to Alain Prost. Alboreto drove a hard race; he eventually caught and passed Prost 3 laps later, but was re-passed by Prost after he punctured his left rear tyre at the first corner where Piquet and Patrese crashed. This dropped him to 4th behind Andrea de Cesaris, Elio de Angelis and Prost; he caught and passed his compatriots but could not catch Prost; who despite a leaking turbo wastegate, had kept the gap wide enough for Alboreto to be unable to catch him in the remaining laps. ^ "1985 Monaco Grand Prix". formula1.com. Archived from the original on 16 December 2013. Retrieved 23 December 2015. ^ a b "Monaco 1985 - Championship • STATS F1". www.statsf1.com. Retrieved 19 March 2019.